In about a year I am moving to Tennessee as I’ve mentioned on this blog previously, and it is starting to feel closer and closer. I’m sure this last year will go quickly, and I’m starting to make plans for how to move my garden. One of the benefits of moving, in addition to the much better climate, is the land. I have 20 acres in Tennessee, here in Michigan I have maybe ¼ acre, and only a fraction of that able to be garden. I have been planning my gardens down there since we’ve bought the land, and I know I have, literally, acres of planting to do, that is something that requires planning. For instance, in the front yard by the driveway, I know I’ll want to do a formal hedge like in an English garden using different colors of barberry. I will need maybe a hundred golden barberries and a hundred red ones to achieve my design, and these are plants that usually sell for $5-$10 each at the cheapest. It quickly adds up. So what I’ve started doing, a year out from now, is harvesting from my own garden as much as possible so as to seed my future garden as cheaply as possible. 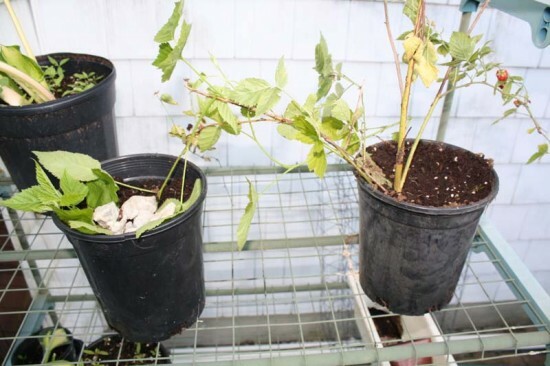 This means propagation, and one of the most common ways is with cuttings. Cuttings are one of the most common methods of propagation, one that most know of, even if it isn’t suitable for all plants. 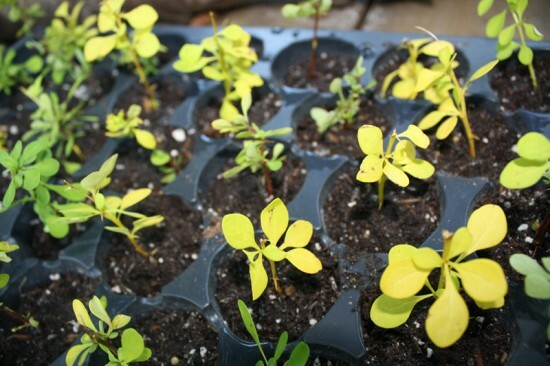 Barberry luckily for me does very well with cuttings and so I have approximately 148 golden barberry cuttings in trays with now, hoping that enough of them take root to give me the plants I need. I also had some barberry cuttings spawned from my regular hedge trimming just growing in various places, volunteer cuttings if you will, and I potted those up. Next step will be for me to take some from my red barberries and do the same thing. It is a bit of painful work, barberry have thorns, and it is delicate work, which means the loss of dexterity from wearing gloves is annoying, but if it saves me hundreds of dollars, I’ll do it. I know somewhere out there someone is likely fuming “Barberry… but that is invasive where I live how dare you plant it, and plant so many!” Relax. Not every barberry is invasive everywhere, and not every barberry is invasive at all. Many hybrids, like the ones I’m using are sterile. If the cuttings take I’ll transplant them into larger pots, of course, before I take them to my new garden. I also plan to do a lot of edible gardening with my new land, and one of the things I plan to grow are boysenberries. Boysenberries spread with underground runners like raspberries do, but they also have very very droopy canes, and where the canes touch the ground they’ll root, forming a new plant. Many plans do this, most if not all vines for instance, verbenas, hydrangeas can. Some plants do it quickly and easily without any help, some need a little help. But this is a great way to get new plants because the new root system is fed by the parent plant until you cut the cord, so to speak. The plants can be much more successful than with cuttings, which have to develop a new root system without a current root system pumping over nutrients. Propagating boysenberry by layering from one container to the next. With some plants you must bend down a portion of stem or cane, sometimes peel back park, and maybe pin it to the earth, or put a brick or layer of something on top of it to ensure consistent contact with the soil. My boysenberries likely do not need the help, but I am pinning them down with a few rocks to help increase my quantity of potted plants. These I plan to take down this fall, plant in some out of the way area of my 20 acres where construction will not damage them, and let their national spreading instincts take over, so that late next summer when we move I can transplant them into rows in my berry orchard (with a trellis). Many plants, over time, simply grow and spread naturally, and you can dig and divide the root balls or otherwise and form new plants. This is how I’m dealing with my raspberries, digging up all the little plants that have spread from underground runners. Raspberries could also be done with layering I think, but their more upright rigid canes make it more difficult. Other plants that can be done with this method are any sort of ornamental grass, any sort of groundcover really, daylilies, hostas, irises, and many other perennials. Often you need to dig and divide a perennial every few years anyways just to keep the garden fresh, selling the divisions or giving them away. I haven’t started yet but I definitely will be doing this with my daylilies. I have quite a collection of daylilies, including some rare and more expensive varieties (I paid $200 for my most expensive one if you can believe that. Yes, sir I’m addicted to gardening). I won’t want to scalp my yard and leave it barren for the next owner, I take pride in the garden I’ve created, but I will be taking divisions off many of my plants, leaving some behind in place for the next owner of my current home, but taking others with me. It is a money issue again really, if I needed 100 daylily plants, even at $5 each that is a steep bill, but I can easily pull 100 divisions off my garden. If I really tried I could probably pull a thousand divisions, I have a ton of daylilies. The majority of my ornamental beds are bordered with them. And the most obvious method of propagation a plant is with seeds, though this is no true propagation is it? You’re not planting more of the exact same plant if it is a hybrid, you’re planting its children, which could be entirely different, but nothing beats it for price. It also take more time. A daylily planted for seed can take over a year before it flowers for the first time, and it will look different from its parents. I’ll be taking some of the non-hybrid plant seeds I have with me, things I seed every year like lunaria annua. . But I’m also thinking about hostas. My favorite application with daylilies is as a border, a whole row of the same plant, with the same flower color. So daylily seeds, which produce random offspring, aren’t a good avenue to achieve what I want. However, my favorite type of hosta planting is a big bed of a bunch of random different sized and colored hostas. I don’t much care about tracking individual cultivars like I do with daylilies (though, I do like exceptionally large hostas, which are typically cultivars). So, in addition to taking divisions of my plants, I also am trying to do some pollination this season and will collect the seeds and see about using them to seed a large hosta bed in the shadier locations of my new property. I do have different areas picked out on my land in Tennessee for sun ornamental beds, shade ornamental beds, that one formal bed I mentioned above, informal beds, and of course an epic martha stewart sized vegetable garden. I don’t like throwing things away, so over the years, when I’ve bought plants, I’ve saved the little cheap plastic pots they come in, and so I have quite a collection, but I also use those when I give plants away, and well, I don’t have enough for all that I’m doing. Luckily for whatever reason, there has been, seemingly, in recent years, a growth in stores selling all the equipment you need for plant propagation and container growing. The trays and pots and everything else. I guess there must be new industries in some states where people are often growing plants in their home, can’t guess what that is…. So anyways, I was able to buy the trays and bulk pots for fairly cheap at greenhousemegastore, shipping was quick too which I like. You could also be frugal and repurpose (clean) household containers that you would otherwise recycle, all your tin cans and or plastic bottles. Just make sure you drill drainage holes in the bottom. They are might not be UV stabilized so might not last long. An established garden really can be fruitful, I’ve read articles before where people make thousands of dollars a year doing driveway sales of divisions and cuttings taken from their gardens. Gardening is perhaps a unique hobby in that way. If you go fishing, your odds of catching more fish don’t increase with every fish you catch. But when you garden, your garden itself increases the size of your plant collection every season, and you can use that bounty to expand your gardens, make a little spending money, gift friends and family, or beautify public spaces. Nice to know that over here in the UK that there is much more room when it comes to gardens! Seriously though, all the best with your move and to a new, bigger garden!